Magical Stone? 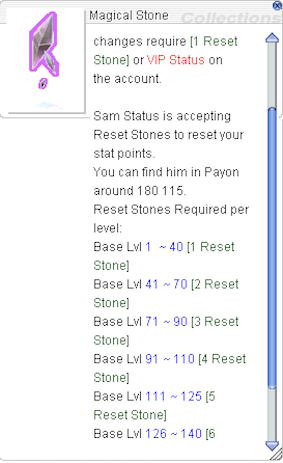 Reset Stone? Any chance to give "them" an unique name? Magical Stone or Reset stone, is used by many players everyday. And for normal players like me, we all know that those refer to one item. However, for new players, and players from other servers, this is really confusing. And many people wasted time and money just because of the names. may i add: Neuralizer not working in Prontera. At the very least include it in the description as it can be frustrating to those who are unaware. To never fail to fail you. Moved to technical section. Will be reporting this up shortly. Edited by VModCinnamon, 03 January 2018 - 05:28 AM. The issue is not just renaming them. The dialogues should be updated as well. Ctrl + F. Replace all exact words containing 'Reset Stone' to 'Magical Stone'. Not sure why this is so hard. They've been calling them Reset Stones for years, don't understand why they needed to be renamed all of a sudden. It's only going to be confusing for people looking for the Magical Stone accessory.